Understanding the way in which materials fail under load is crucial safety, regulation and industrial applications. Both elastic fracture mechanics  and elastoplatic fracture mechanics [2, 3] are widely used to predict failure of ductile metals. However, recently predictions of ductile fracture in engineering circumstances has shown a discrepancy with experimental observations of strain-to-failure value reducing trust in models for producing safety cases. New work by Noell et al have suggested that the inaccuracy of these models is due to them being based on the competition between tensile-dominated loading and shear-dominated loading. It is presented in their paper “The Mechanisms of Ductile Rupture” that there are actually seven different mechanisms that contribute to the complex ductile failure of materials. Early work by Bao and Tang proposed that ductile failure was driven by a combination of void growth and shear decohesion . This however makes two restrictive assumptions voids are pre-existent (or nucleate early) and that the growth and coalescence of these voids is the rate-limiting mechanism for failure. By comparison Noell et al propose mechanisms which fall into three broad categories: void nucleation, growth and coalescence; void nucleation and growth; and void-free rupture. Paper Fig. 2. Schematic representations of seven different macroscopic ductile fracture mechanisms are shown: (a) intervoid necking, (b) intervoid shearing, (c) void sheeting, (d) the Orowan alternating slip (OAS) mechanism, (e) specimen separation by necking to a point, and (f) and (g), which show specimen separation by single-plane and multi-plane catastrophic shear, respectively. Detailed definitions of each of these mechanisms are provided in the text. To illustrate their comprehensive approach the ductile failure of three face-centered cubic materials are considered. These examples show that the plasticity-induced microstructural evolution has a profound effect on the activation of failure mechanisms and that failure can occur in stages. Elimination or creation void-nucleation sites in the early deformation of material can significantly influence the competition between different failure mechanisms. In high purity Aluminium with a high local stress triaxiality (hydrostatic pressure / von Mises equivalent stress) lead to necking to a point (wire) or intervoid necking (sheet). However, using the same experimental methodology for Copper the change in microstructure caused by the initial intervoid necking lead to a reduction in the local stress triaxiality and so a change in the failure mechanism to Orrowan alternating slip, OAS, (wire) or void sheeting and eventually OAS (sheet). Observations in Nickel also show the evolution of failure mechanism in wire (Intervoid necking to Intervoid shearing) and sheet (Single-plane catastrophic shear to Intervoid shearing to OAS). These comparisons show the distinct effect of microstructure and strain-hardening on the route of failure as each mechanism facilitates the one that precedes it. 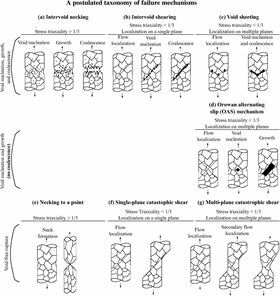 Broadly Noell et al put this into two camps: 1) microstructure dependent competition between void-based (a-d) and void-free (e-g) mechanisms and 2) strain-hardening capacity determining intervoid shearing or void sheeting.